Why Eat One Crêpe When You Can Eat 25? Novelists say that their characters talk to them, tell them what must happen next. I would roll my eyes at this if ingredients didn’t talk to me as well! 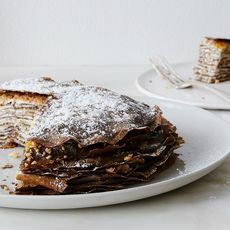 I wanted to make a buckwheat crêpe cake. For dessert. 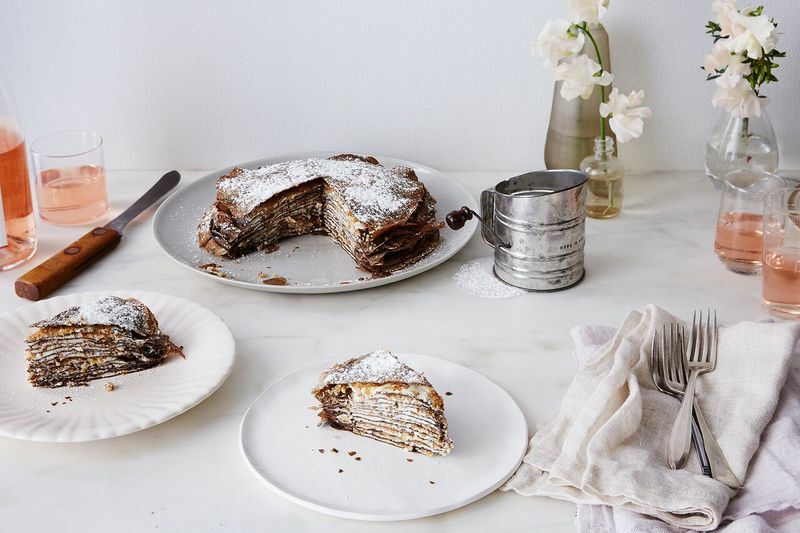 I know that buckwheat is traditionally used for savory crêpes, but I like buckwheat, and have make some stunningly good desserts with it. I was thinking about filling it with chocolate and nuts and plum jam. I was sure enough of myself to draft an entire recipe before I even tested the concept. As it turned out, those ingredients didn’t want to be there. 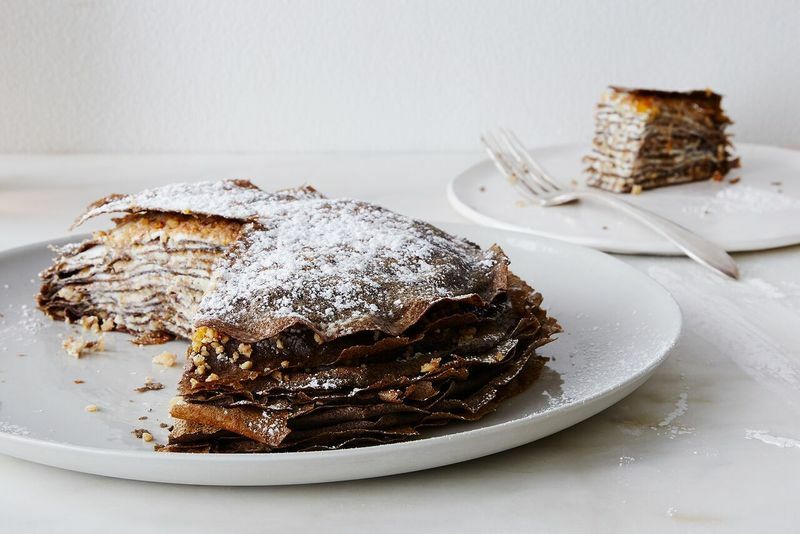 A crêpe cake (for those not around in the 1970s) is a stack of crêpes with filling in between. Fillings can be savory, like cheese and ham, or sweet, like Nutella and banana. The “cake” is made ahead and refrigerated. To serve it, you heat it up in the oven, and then slice and serve it like a cake. The great thing about creating a new crêpe cake is that you can preview the flavors and work out the quantities by topping and tasting a single crepe—you don’t have to stack and fill all 25 of your crepes until you are pretty sure you’ve got the filling worked out. This is fun, and a lot of sample crêpes can be consumed along the way. So I’m in the kitchen with a stack of buckwheat crepes, and, to avoid eating too many sample crêpes, I’m tearing off bits and tasting the pieces with tiny amounts of different dark chocolates, walnuts, and some dark fruit preserves (black cherry, plum, blackberry). But I’m not as thrilled as I expected to be. I think something creamy, like cheese, wants to be there as a counter point. I like the idea of goat cheese—its tangy saltiness would be a nice little yin for the sweet yang of preserves and the earthy chocolate—but I wonder if people might shy away from goat cheese in a dessert. So I try some truly gorgeous, real, whole milk ricotta. It’s not only boring, it’s shockingly not even good. I’m still loving the walnuts, but the chocolate doesn’t want to be there (so I let it go). Even the preserves are getting antsy. I let them go as well. In the end, the buckwheat crepes and the walnuts insisted on goat cheese. They both wanted honey, and I dared to propose a little orange zest and cinnamon. They are all happy together now, which means I’m happy too. I promise that your guests really will be happy with a little goat cheese for dessert. If you are unconvinced, hedge your bets and serve it for brunch. Just don’t miss it. This article was written by Alice Medrich from Food52 and was legally licensed through the NewsCred publisher network. Please direct all licensing questions to legal@newscred.com.